Use the IAP Batch Submission feature in the developer console to import and submit multiple in-app items at the same time. Refer to Submit Single In-App Items] for information about creating single in-app items using the Developer Console. The system provides a CSV template file that contains several example entries. You can download the CSV file using a direct link, or download the file using the link in the Developer Console. You can download the CSV template file to your local machine. Log in to your developer account on the Amazon Apps & Games Developer Portal. Scroll down to the Dashboard view to see your apps. Click the link to your app to view the app detail page. Click the In-App Items tab to view the current In-App items for this app. 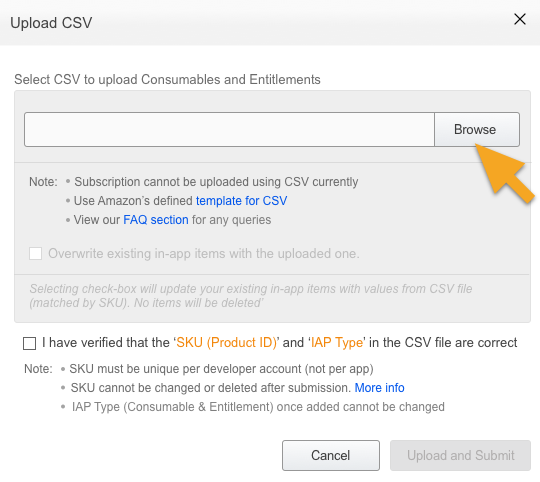 Click the Import Multiple IAPs using CSV button. The Upload a CSV file to Import IAPs dialog box opens. Click the template for CSV link. Save the template file to a location on your hard drive. Edit the CSV template file. Create a new row for each IAP item. You can export a CSV file that contains all of your existing IAP items. You can also export a filtered list of items (all Consumables or all Entitlements). From your app main page, click the In-App Items tab to view the current In-App items for this app. (Optional) Click either the Consumables or the Entitlements check box to filter the items to export. In the Export Multiple IAPs dropdown list, select CSV as the file format. The system downloads the CSV file to your local machine. From your app main page, click the In-App Items tab to view the list of current In-App items for this app. In the dialog box, click Browse to select the desired CSV file. The system automatically starts a validation check of the entries in the selected file. File passes the validation check - the Upload and Submit IAPs button and the Product ID verification checkbox become active. If the file contains errors, click the Download the CSV link to view the errors and make corrections. Run step 3 again. When the file passes the validation check, optionally check the Overwrite existing in-app items option. If you set this option, the row values for an item in the CSV file will overwrite the currently stored item (with the matching Product ID field). Click the checkbox after you verify that the Product ID values and IAP Types in the CSV file are correct. The Product ID (SKU) name for the IAP item must be unique across all of your apps. You cannot modify or delete a Product ID (SKU) after the IAP is submitted. You cannot change the IAP Type of an IAP after the IAP item is created. the number of IAP items with import errors. Click the link provided with the error message to view the associated notes for each of the import errors. Use the gray arrow icon (in the top right corner of the status panel) to expand or collapse the panel. 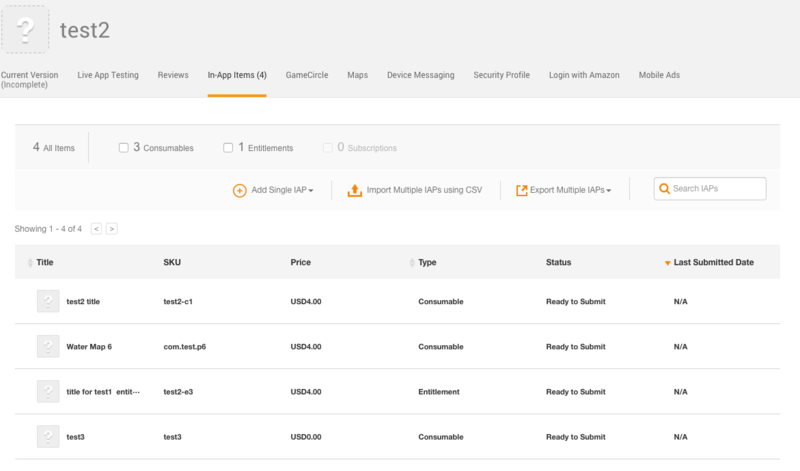 After you have entered all of your in-app items, you can click the Export Multiple IAPs button to download a CSV file containing all of the data for your items.